I've spoken before about the issues, or the potential issues we have with our flat nose dog breeds, our brachycephalic dog breeds. These include our Pugs, our French Bulldogs, our Bulldogs, and many more. Any breed that's got a really squashed nose. The other issue is that a lot of us as owners simply aren't recognizing these things as a problem. We are accepting them as normal! We think that our dogs snorting and snoring is cute and it's normal. BUT IT'S NOT! It's a sign that these dogs simply cannot breathe. If a dog can't breathe properly, then there's no way that you can tell me that their welfare is optimal. Now, they might appear happy, but they may not be as energetic, they might not be as playful and they might not be able to do all the things that they really want to do. They're excellent characters, don't get me wrong. They're fantastic, they're super friendly, they're super social, they're very gentle in nature. Their temperament and their character is fantastic, but their bodies don't allow them to express their full nature in a large number of cases. Of course, not every dog in these breeds is going to have all of these problems, but the actual proportion of dogs that do is very high. Personally, I think it's unacceptably high. Lets take a look at Zsa Zsa, our bulldog who won the ugliest dog competition in 2018. You can see that she's got massive shoulders, her elbows are turned outwards so her joints and her legs are deformed. She's guaranteed to have arthritis, no question, no argument. She's going to have arthritis, her mobility is going to be compromised, and she's going to be painful because of her confirmation. She's also got the most massive tongue you can imagine. That's something that we see with these guys. They've got very short noses, their bones have gotten shorter and less, but the soft tissue within their mouth, within their throat, is still the same. Everything is kind of squashed in. Their airways are really tiny. So in some cases with these Bulldogs when you come to anesthetize them, you're putting a tube down into their windpipe that is the same size you are using in a big cat! You can't get anything bigger down. That's just unacceptable. We're breeding lots of problems into these squashed nosed brachycephalic dog breeds. Their popularity is also rising, with our French Bulldogs being the most popular dog breed in the UK and fourth most popular (and rising) in the US. Without good recognition of these problems, without people being aware of other things to look out for, then things are only going to get worse. We're only going to see more dogs that are suffering. Of course, I'm not picking on the brachycephalic dogs in particular. I'm not saying that no other breed has got problems, of course they do. We know Dachshunds, for example, have got a massively higher incident of joint disease and a serious issue with developing slipped discs. West Highland White Terriers are terrible for getting itchy skin. But the tragic thing with brachycephalics, it's not only their increasing popularity. It's also because these breathing problems especially affect dogs at a really young age. With our Dachshunds, with our German Shepherds or Labradors and their hips and arthritis, they often affect these dogs later on in life. They're healthy when they're young, but become unwell later on in life. Not that this is acceptable, but with our brachycephalic breeds, they're becoming ill or their quality of life is compromised, sometimes from the very moment they're born. Certainly from a very young age they're going to get compromising problems that really have knock-on effect on their quality of life. In some cases, simply their ability to survive is compromised. The other thing we see is that there's no way that some of these dogs can actually give birth naturally. If you look at Zsa Zsa, you'll see the size of her head, the size of her shoulders are enormous. There's no way that a puppy that shape could fit through the pelvis and delivered naturally. We're actually breeding dogs that are unable to give birth naturally! Just think about that for a minute. This also reminds me of something that I saw on Crufts this year. The British Bulldog stand made some pretty shocking claims (I think it also won the best stand at Crufts, which is something else to think about). 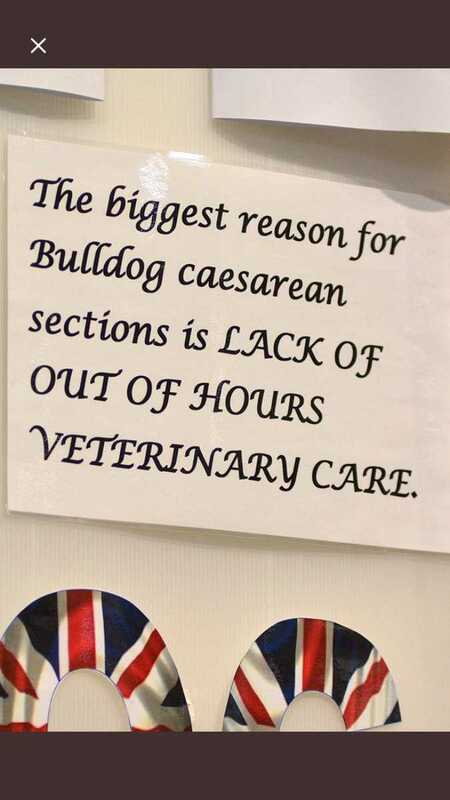 Their comment was that actually, it's not that Bulldogs can't give birth, the reason that they have so many cesareans is because of lack of availability of vets to do after-hours work. This is simply ludicrous given that all vets in the UK are required to provide an after-hours service. They don't have to do it themselves, they can arrange for it to be provided by a third party, but all vets in the UK are required to provide an after-hours service to their clients. So quite how that bulldog stand can make that claim is staggering...words just fail me. There are things that we can do as owners. If you really would like a brachycephalic dog, by all means, go for it. But go for it with open eyes. Choose a breeder who is breeding for health. Choose a breeder who is looking to put their nose back on their dogs. That's going to make their risk of breathing problems less. It's going to make their risk of skin infections because of the skin folds less, if their confirmation is better, it's going to make their risk of developing arthritis less. Make sure that you keep your dog a healthy weight. Obesity is a major contributing factor to breathing difficulty; there are all kinds of things that we can do to try and reverse this worrying and very upsetting trend. There are definitely things we can do, and that's what the campaign #breedtobreathe was all about, and is all about. It's about raising awareness, letting people know what problems that their future dogs might face, or their current dogs might face, and what we can do to go about it. You might look at the picture of Zsa Zsa and have a little chuckle, but when you actually think about it, when you think that she is the result of what we of humans have done in breeding our dogs; we're not breeding them to be healthy in some cases. We're breeding them to live a life of crippling pain or being unable to breathe. That just can't be right, can it? If you've got any comments on these issues I'd love to read them in the comments below. Share this with anyone you know who either has a squashed nosed dog, to let them know that there are things that they can do, or share it with someone who is thinking about getting one. Just so that they know that they need to look out for (and here's another post to read all about choosing what puppy is best you). Our Pets Health, because they're family.